Mary Anning was an English paleontologist and fossil collector. She did not receive any training but her technical illustrations were very detailed and accurate. Her findings gave her the title ‘the greatest fossilist the world ever knew’. 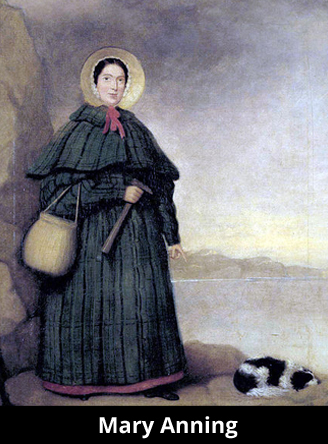 She was born on May 21, 1799, to Richard and Mary Anning. Her father was a cabinet maker, carpenter, and an amateur fossil hunter. Those fossils were cleaned, polished, and then sold to tourists. The Annings had 10 children but only Mary and her brother Joseph made it to adulthood. Her father Richard Anning died in 1810 leaving his family destitute. Mary survived a lightning strike when she was only 15 months old. A neighbor who was holding her took shelter under an elm tree. He got killed but Mary was unhurt. She was born in Lyme Regis where the cliffs are rich in spectacular fossils from the seas of the Jurassic Period. Mary learned a lot about fossils from her father and developed skills in fossil hunting. In the year 1811, Mary found a well-preserved and nearly complete 17 feet long skeleton. It was later named as Ichthyosaurus. This skeleton of Ichthyosaurus was sold for 23 pounds. She made various great discoveries but the most important one was when he found the first Plesiosaur. Plesiosaur was a nine feet long reptile with a long neck, short tail, small head, four flippers, and lived in the sea. In 1826, she opened a shop ‘Anning’s Fossil Depot’ that was visited by various important geologists from Europe and New York. Mary Anning found the very first pterosaur in the year 1828. She died of breast cancer on March 9, 1847, at the age of 48 years. Declan, Tobin. " Facts for Kids about Mary Anning ." Easy Science for Kids, Apr 2019. Web. 25 Apr 2019. < https://easyscienceforkids.com/mary-anning/ >.